Presented by Dave Ansell, Ginny Smith, Kate Lamble. Superconductors are the key to magnetic levitation, from people on platforms to entire trains. But what is a superconductor? David - A superconductor is a material that, when you cool it below a certain temperature, it loses all resistance to flow of electrical current. So, you can either get very big currents down your superconductor or you can use that current to generate very big magnetic fields. The currents are bigger than you can get down any conventional material and the fields it produces are bigger than any other source. So, things like, anybody who's had an MRI scan, that field would've been generated by a superconducting coil. You just can't achieve those fields using conventional metals like copper. Ginny - What other kinds of applications are they used for at the moment? David - There are three different types of superconductors. You either make them in long thin conductors where you can pump current down and you can control it. Because the material is superconducting, for a certain type of current, there's no loss. Significant amount of power we generate is actually lost by heating wires - 10% or 11%. If you could make your cable superconducting then we'd get rid of all that loss. So, there are big energy efficiency gains. You can make them in the form of bulk materials. Some people call them hockey pucks and you can use those materials like you'd use a permanent magnet. But the field you generate is a lot bigger. The final is a thin film form. That's a very small amount of material but with very good properties and you can use those in things like electronic applications, microwave filters, generators, basically, the electronic small scale industry, so different range of material forms, each of which has its own benefits for a specific type of application. David - Yeah, absolutely. So, what I'll do is I'll demonstrate the properties of a bulk material. So what happens is, if you have a magnetic field and I've got one here. It's a speaker magnet. I'm going to bring the superconductor towards the speaker magnet. We've got this thing called Faraday's Law and that tells you that that will cause the current to flow. The current will generate a magnetic field and by Lenz's Law, that field will be in a direction to oppose the change it's causing it, GCSE physics. So, as I bring the superconductor down, we've got this current established. If it were copper, that current will decay away. The superconductor has got no resistance so when the current is induced, it continues to flow - it persists. So, the field it produced persists and therefore, you've got a levitation force or repulsion force. So, if I just bring the superconductor down now on top of the magnet, you can see it's levitating away, right above the superconductor there. And it will stay there until it actually warms up through its transition temperature. This is about minus 196 degrees or when it gets above its transition temperatures, then it becomes non-superconducting and it'll lose its levitating properties. Ginny - So, those two magnets are repelling in the same way that if I've got a pair of bar magnets and try to bring these north poles together, I would be able to feel a force. Is that the same idea? David - It's exactly the same force except if you try to bring 2 bar magnets together, you wouldn't be able to levitate one on top of the other. One would flip around and north would attract south. So, there's an intrinsic instability there. So, one property we've demonstrated with a superconductor here is that you get this stable levitation and that's something you can't achieve with permanent magnets. Ginny - Now, that's cool, but it's not very useful, levitating a little hockey puck-sized thing. Can we use that for anything more practical? Ginny - Lucy is getting quite cross when you're saying that. David - ...half a volume or weight. Ginny - So, we don't have a train that we can levitate today, but we do have a Kate. Ginny - Can we have a go at making her levitate? Kate - There's a big box in front of me which is white and there's a lot of smoke coming out of it and I can see sort of ice crystals forming around some of these screws that are holding it together. It looks quite intimidating, David. What's going on in this box you are asking me to stand on purely from faith. David - We've got every confidence in you there. So, we've got an array of these bulk superconductors and the platform on the top at the back of it, we have a ring of permanent magnets. When the permanent magnets meet the superconductor, they're levitated. It's just the inverse of what we've done here. Now, if we try to bring the magnets closer to the superconductor, additional currents will be induced and that will be resisted. If we try to move the plate from side to side, we're changing the field of surface of the superconductor. It will try to resist that. However, the plate has got circular symmetry. So, if we were to rotate the plate, the field at the centre and the surface of the superconductors is constant. So, there's no resistance to that motion whatsoever. So the bottom line is, the plate won't move up or down very much. It won't move from side to side very much, and if we try to spin it, there's no resistance. Kate - So, I'm not going to float across the room, but I could get dizzy as what you're saying. David - We can make it into a linear motor, not tonight, but another time, then you might float across the room. Kate - If only. Is there any chance that I could be too heavy for this? Is there a reason that I'm doing it rather than say, Dave? No offense, Dave. David - I'm glad you said Dave and not me actually. Like all forces, if you apply forces equal and opposite, the forces supporting you, you will overcome it and the thing will collapse. But I think it's probably about a thousand Newtons at least that you'd have to apply, so 100 kg in order to support. Kate - Okay, so basically, I shouldn't be too fat for this. David - I think you should be okay. My money's on you. Kate - I'm having to get Dave to hold the mike so I don't spin around. Okay, so immediately, I'll spin. So, I did promise the people levitation tonight, but Dave is going to have to follow me around in circles with the microphone here. David - You need to push on something. Kate - It's not a very good magic trick. It's not like I'm basically being Dynamo off the telly and I'm floating metres off the ground. By how much am I levitating currently? David - It's probably about a centimetre. Kate - About a centimetre, okay. Let me give it a spin. Okay, I'm getting really, really... So, there's no way of it stopping basically. It's what we've established with that experiment. David - Well eventually it will stop. Kate - How long is it likely to take? David - We could wait until it warms up. David - About 40 minutes. Kate - 40 minutes of spinning, I'm not sure I can last that long. I might have to push in the opposite direction. I'm genuinely dizzy right now. We're going to have to just wait a moment. So, this is awesome, but we said that trains might be useful. Do trains use exactly the same system or is it adapted slightly for humans? David - It's the same principle. A train might use four of these and a linear railroad in a circular track. So, you get linear motion just in the same way that you've got circular motion here. Kate - My feet are currently getting cold because there's a lot of liquid nitrogen underneath me right now. Now, you mentioned it wouldn't work when it warmed up. So, are we having to permanently pour liquid nitrogen into train tracks to get maglev trains to work? David - Well, you can cause things electrically, so you need a power supply rather than a vat of liquid nitrogen. So, there are other ways to cool it, but they're not as spectacular as this way. Kate - It's not as spectacular. I'm not sure how am I ever get off this. I could be stuck here for the rest of the show. Ginny - A round of applause for Kate as she attempts to climb back down. So, we've just said that you need a big vat of liquid nitrogen to cool this. I guess that's probably one of the big limitations that's stopping us from using superconductors in more things nowadays. Is that something you're working on? David - I guess the question I'm asked more than any other is, at what temperature do these materials superconduct at? Will we ever get room temperature superconductivity? There are two solutions. One is, if you're a physicist, it matters because that tells you about the pairing mechanism, what's causing superconductivity. If you're an engineer, you're not really bothered about that. You're bothered about how much current can it generate, how much fuel can it produce. So, we work with the best materials we have. It just happened to be the ones that we need to cool to these low temperatures. But in a real application, as I said, you wouldn't need a liquid cryogen. You'd use like a high tech fridge. I mean, you don't pour a cryogen in the back of your fridge to keep your milk cool. Yet, you can maintain a freezer at minus 25. So, you can use a glorified fridge. It's called a Stirling cycle cooler. You can actually achieve 20 Kelvin, so well below this temperature. But it's not something you'd find in a vacuum cleaner for example. But it might be something you'd find in an industrial plant that involves moving heavy masses across a workshop floor. Boeing may levitate their aircraft on their production line using this technology one day. We don't know. Ginny - Now, we're going to go over to some questions in the audience in just a second so get your thinking caps on. But first Kate, have you got a question that came in on social media? Kate - Gerald (McMullen) on Facebook and we've just mentioned maglev and things like that, he said, "Whatever happened to levitating trains?" He doesn't think they're still around. David - No, there are. There's a fairly well-documented train in Japan using low temperature superconductors. 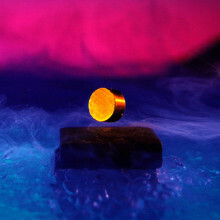 Not liquid nitrogen temperatures but liquid helium temperatures superconductors. There's one in Shanghai from Pudong Airport to downtown Shanghai. There's a couple in Germany. So, they're around. The problem is, the tracks are expensive as you can imagine. So, you're looking at, at least an order of magnitude more expensive than a normal train, but you can travel at speeds of getting up to 500 km per hour. Ginny - So, who's got a question about superconductors and high speed travel? We've got one down the front here. Anastasia - Hi. I'm Anastasia. I'm originally from Russia. I wonder how do they break those trains. David - Essentially, there's a jet on the train. The superconductors give you levitation. If you have a clever arrangement, you can get a bit of propulsion. But essentially, all you're using the superconductors for is a frictionless platform. It's low temperature flying. So, like an aircraft, how does an aircraft go forward? Well, thrust is provided by the jet engine so you'll need some on-board mechanism of propelling. A big fan on the back of the train might do it. Sam - My name is Sam. I'm 12 and I'm from St. Ives. You said if it warms up, it will stop spinning. If you had a train going straight, if it warmed up, will it just suddenly stop half way through a journey if it warmed up? David - We wouldn't allow that to happen, would we? That would be a big problem. So, what you do is you have a failsafe mechanism. So, you wouldn't just rely on levitation. You'd have a wheel base system. So, if it warmed up and it doesn't warm up quickly as you saw with the demonstration. It warms up slowly. As it warmed up slowly, the train will get lower and lower, and lower, and then it would land on its rails, and it would carry on. So, it would then go in its wheels rather than being magnetically levitated. At that point, you would've slowed the train down. It would be a conventional system. Gareth - I'm Gareth. I'm 12 from Huntington. How many years do you think it will be before we actually get levitating trains or other vehicles? David - We've been saying 5 years for about 15 years, but I think reality is, that we are getting very close to applications. I don't think they'll start with levitating trains. I think they'll start with smaller devices that do very unique, very niche things that we can't do using anything else. I think levitating trains may be where we get to eventually, but to begin with, I think we need to do things that use our imagination or that we haven't thought of before. We're working on a number of devices that do exactly that right now and the turnaround time for those devices are about 2 to 3 years. So, I really believe that in that timescale, we're going to get commercial applications of these materials. Whether it's a levitating train, I doubt, but sometime in the future, almost certainly, levitating trains as well. Danny - Hi. My name is Danny and I'm also 12, originally from Syria, but I moved to England. I'm asking, roughly, how cold is liquid nitrogen and what material are they planning to use for levitating trains? David - Okay, so liquid nitrogen is 77 Kelvin. If you look at the Kelvin scale, absolute zero is minus 263 degrees C. So, it's pretty cold. So, 77 Kelvin is minus 196 degrees C. I gather, if you go to the very north of Finland, you're approaching room temperature superconductivity because it's pretty cold up there, but not quite that cold. 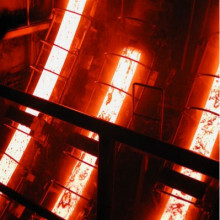 So, it's minus 196 degrees C. That's the temperature that we operate these materials at or lower. The lower in temperature you go, the better the performance. Your second question was, what material. Well, these materials, they look black. They're ceramic in nature in terms of properties and they're a complex mixture of elements. So, this one is yttrium, barium and copper with a bit of oxygen in there. So, yttrium barium copper oxide. That's the basic material. You may change the yttrium, but you will have the barium, the copper and the oxygen there. So, yttrium barium copper oxide, we make them in a furnace at about a thousand degrees C.
Ginny - That's pretty extreme. So, I think we've got time for more questions. This gentleman in the white shirt had one. James - Hi, there. James, 28, a bit older than the rest of the guys. David - You don't look it. James - I'm from Cambridge. I think you almost solved your own question about how you might do levitating trains because it's expensive, but on the long sections of the track in the countryside, you could levitate the train and then as you said, when you get into train stations or near cities, you just lower the temperature down and then they could just run on their tracks. David - Yeah, you could. The problem is, you've got a thermal mass and with transport, you got to have instant changes. So, you can't wait 3 minutes for something to warm up. I think the way to do it is not to warm it up, but it's to divert the field. So, you do something else to the field or in this particular case, if you're moving at a high speed, you've got a high field rate of change. That induces another field and therefore, you get levitation. So, when you slow down, it will land automatically. That's the best way of doing it, but the cost is still in the track and is hugely expensive. If anybody has ever been on the Shanghai Maglev, just looking at the track, it just oozes Yen. You can see it and it's hugely expensive. Sinan - Well, there's a very important saying which I think belongs to Nicholas Ambraseys who was a very big important man in our field. He said, "Earthquakes don't kill people. Buildings do." I think this lies at heart of the issue that we all live in buildings. We all need civil structures to actually sustain our society and we need to protect them from earthquakes. Earthquakes happen over hundreds of years. They don't stop and our Earth is going to keep on giving us shakes here and there. So, we need to be prepared for these important events. They're very costly when they happen even when we actually manage to stop buildings from collapsing, stop that occurring during earthquakes. They can be very costly and they can be - if that happens on a regular basis, that can be very damaging economically. Ginny - Are there some buildings that are more susceptible to earthquakes than others? I mean, I imagine the sort of really tall skyscrapers you see are probably more dangerous than old fashioned, sort of lower houses. Sinan - I'm not so sure because it's a complex issue in the sense that when you make a structure which is small, compact, stiff, that structure will end up attracting more load. Actually, the structures you mentioned, the skyscrapers, they're all engineering structures. It's actually quite rare that you would find them in places where there's recurrent danger of earthquakes. So, there will be building regulations which would actually limit the number of stories or suggest that there should be technologies in place to actually prevent these buildings from moving a lot. So actually, certain buildings are certainly more susceptible to earthquakes. For instance, masonry buildings would be one example and a recent earthquake that happened in Christchurch for example was a good example of this where the earthquake hit at a city centre and city centre was full of beautiful old masonry buildings. You must've all seen the Christchurch Cathedral after the earthquake and it was in shambles. So certainly, there are structures which are more susceptible and these are generally structures which are not engineered to withstand earthquakes with modern science. Ginny - So, what can you do to make a building more resistant to earthquakes? Do you build one that won't move when the earthquake happens, it'll just stay nice and still so everyone inside is safe? Sinan - That ideally would be great because if we had something that's rigid, if the ground moves, if you've got something that's sitting on a ground and it's completely rigid, the accelerations in that building will not exceed that of the ground. Whereas if you've got a flexible structure, I imagine a very tall skyscraper as you've given an example, that building actually will amplify its motion at the top stories, you will get a lot of sway. And the strategies that we can do is actually, we can design our buildings to be completely elastic during an earthquake which is, the earthquake will happen just like you move a rubber band, you pull it back, you leave it and then it comes back to its own original state. So, we would ideally like to do that. We would ideally like to have a building which doesn't get damaged, but that's just far too expensive. So, what we do instead is we try to decouple the structure from the motion of the ground during an earthquake. So, that would be called base isolation. That's one strategy and the second strategy is what is really commonly adopted today. You let the building get damaged during an earthquake, which is quite counterintuitive to people because one would hope that an earthquake-resistant building is damage proof. But what happens is this damage that occurs in a building is actually what saves the building. So, this is another strategy, but what earthquake engineers want right now, what is our biggest challenge is, actually making structures which are safe during an earthquake and which do not get damaged. It's actually a big challenge. Ginny - Now, I've never actually been in an earthquake, so I'm finding it quite difficult to kind of imagine what happens to buildings during one. Dave, you've got something over there that's going to show us a bit more about how it would actually look if you were in an earthquake - a very, very small earthquake. Kate - Yeah, Dave has been building something all week. What have we got here, Dave? Kate - So, this is the ground shaking more quickly. Dave - As you see now Kate, the building is starting to - it's bending. Kate - It's buckling under - the thing is, it's no longer shaking just in line with the Earth moving. It's sort of bending in the sections in the towers. Dave - So basically, buildings can have a natural speed at which they want to vibrate. And if it's a very strong speed which is resonance of the building, that the building wants to vibrate at, and if the earthquake happens to hit that, the vibrations get bigger and bigger, and bigger, and you get into real trouble. So, I imagine designing buildings to avoid the resonance being anywhere near an earthquake speed is very, very important to them. Sinan - This is something that's quite important that we try to actually take care of in our research. So, the concept of base isolation that we just discussed is essentially actually just this. So, there's a frequency range during an earthquake which the ground will move and you want to move away from that frequency. You want your structure to be away from that frequency so that the motion doesn't build up. So, the typical example of a resonance is, if you're pushing somebody when they're in a swing, so the motion will just build up, build up, build up, and that will be too dangerous. So, what we try to do in a base isolated building is actually, put something very soft underneath the structure so that its frequency will just go very low, and actually, this will decrease the loads that is acting on a structure. Kate - I remember the wibbly wobbly bridge in London. When it first opened the Millennium Bridge, it was meant to be this huge thing and as soon as people marched over it, it started shaking. That was because people were marching in the same resonance. Do all earthquakes have the same resonance though? Can you predict at what sort of frequency it's going to be shaking about? Kate - So, Dave's model is about the height of my hand, but this one's a little bit larger. So, what are we going to be showing with this model? Sinan - So, this is a 3-storey shear frame which is a normal building frame. It's bare. It doesn't have all the other non-structural components. But what would happen is, let's say there's an earthquake and if the building is fixed to the ground, it will start to shake and the building will actually start to take all the load. It will start to vibrate. But what we propose is, instead of - and this idea is not actually our proposal. It has been around for a long, long time. Actually, if you let the building separate from the ground during an earthquake, it will just... If you push a structure like this and hold it from the base, you can see that the columns are all taking all the load and that's actually quite heavy on the columns because we have to design them for bigger forces. But if the structure is rocking and if you push it, what will happen is, it will take the load, but the load will be actually translated into movements. This movement is actually causing the structure to have less load because it's more flexible and it's easy, ready to move and the concept of resonance that Dave mentioned. So, if you move something really far away, this has got a very big motion. Kate - I'm sorry Sinan. So, when you pushed it and held it down to the ground, I could see that the columns were bending. But to me, literally walking the building, tipping half an edge off the ground and sort of letting it tilt backwards, if I was in this building, I'd rather have the columns bend. Is that the wrong way of thinking about it, just looking at this tilting at a 45-degree angle here? Sinan - Well personally, I've never been to one of these things. I would like to be and it's so much easier working on paper. But the interesting thing about these is normally, in practice, what would happen is, instead of this fiddly little bits that we have here which restrain the structure, which restrain the shear frame down, we would have big steel members, steel tendons, which will run through the structure and hold it down. So actually, we would be allowing only very small motions. In terms of percentage, it would be only 1% of the height of the total building. So very, very small movements, we would allow and you would probably not be able to tell the difference in between a structure which is rocking and which is not. The interesting thing probably is that when you're in a structure which is rocking, yes, you would feel the low frequency motion of the structure going from the left to the right. You would feel this, but there would be actually less acceleration of the stories doing this fiddly motion. So, you would actually decrease loads on the structure and that's sort of the interesting thing because that causes the loads to be less. We can design the structures to be more economical and more resilient actually during an earthquake because they don't get damaged. Kate - So, by allowing it to tip from one side to another, imperceptively if I was inside this building, you're putting it under less stress and that means in a big earthquake, it might get less damaged. Sinan - Exactly, that's the case because as I said, the current methodology that we have, we allow buildings to get damaged. This is not good for the long term because after an earthquake, there are millions and millions of dollars of damage. This is very bad for the economy and we want our structures to be safe. Kate - So basically, you're saying, I'm wrong. I want to be in a rocking building rather than sort of the wibbly wobbly one. How can you be sure if you're allowing it to sort of tilt to one side and then come back down again that it will come down in exactly the same place? Sinan - So, that's a very important part of the research that we do. What we want to do is we want to restrain these structures. So, we don't let them fiddle about. As you can see from this model, when it actually rocks, it starts to walk off from its foundations which is quite dangerous. So, we want to keep it in place and the way we do it is, as I said, we would have large tendons which run through the structure. We would have other restrainers, other energy "dissipaters" which would dissipate the earthquake energy coming from the ground and these would actually restrain the movements. So, that's one thing that we would engineer. Ginny - Right. Who's got any questions for Sinan? George - I'm George. I'm 10, and I'm from Ely. Do you really have to make the buildings earthquake proof because an earthquake is caused when two plates crush together or they overlap? Couldn't you just prevent that somehow and then you wouldn't have to have earthquake proof buildings? Ginny - Good question. Why can't we just stop earthquakes? Come on guys. Sinan - That's an excellent question. I think that would actually be a solution to all the problems. But the motions of the Earth are very big. So, these forces of plates moving are massive. When they create these earthquakes, comparing an earthquake force to let's say, a Hiroshima bomb, you can see actually, I don't really have the numbers with me, but you can see actually how big an earthquake force is. It's an unstoppable force. It would be great if we can actually stop it from the beginning, but these earthquakes do tend to happen and they create these as you have said, they're plate motions and they create these big mountains, so you can imagine what sort of big forces we're talking about. Kate - The Earth is still more powerful than a scientist at the moment. Venud - Hi. I'm Venod and I'm from Cambridge, but I'm originally from India. While growing up, I did experience a couple of earthquakes and the major one was the 2001 in West India. That was 7.7 magnitude I think and there was a lot of destruction and loss of life and property, but the main thing was, the capital near my city, there wasn't much destruction, but there were 50 multi-storey buildings collapsed because there was absolutely no earthquake planning there. One of the major local rumours was that few buildings collapsed because they had a big swimming pool on the top. Was there any truth to that or does that affect if you really have a big water body on the top of a building? Sinan - Well, this is very interesting question. I would imagine, this might not exactly be true because it's actually at the top. So probably, what happened was, if there was collapse especially was probably related to lower storeys. 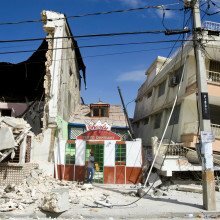 In most of these cases, in recent earthquakes in Haiti for instance where there was massive damage, one of the things that earthquake engineers realise is, during these earthquakes, we are not currently learning sometimes many things new because we actually have the technology to withstand the earthquake, but it sometimes boils down to actually having the regulation, doing it properly. 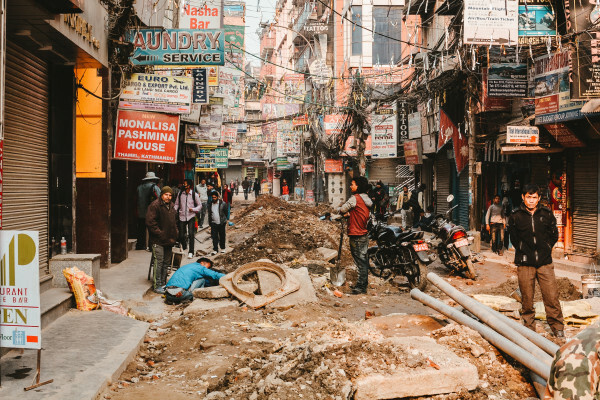 This is a very big problem and especially in the developing world where an earthquake can still actually cause very big damage whereas in developed nations for instance when the earthquake happened in New Zealand, life safety was actually reduced to a minimum. This is quite an achievement in terms of what we've done, but in that case, the economical damage was just beyond control. So, we have to manage both of these ends and that's a very big task I think which extends beyond earthquake engineers, goes to policy makers, and beyond. Justin - Hi. I'm Justin. I'm from Cambridge. I have a question for both the first speakers. Would it be possible to use superconducting technology to act as maybe dampers or motion restrictors for earthquakes? Ginny - Could we levitate our buildings so that the Earth just moves underneath them? That sounds like a brilliant idea. David - It is a great idea and it has been suggested, but it's completely impractical. The best way is, I think there's a guy called Robinson, designed the building isolators, specifically like the Christchurch earthquakes, but it's much better to have a rather viscous damper rather than some of it levitated. Ginny - What, levitate the Earth's whole plate? I think that might need a very strong magnet. Okay, I've got another question from the front row. Jess - My name is Jess from St. Yves. You spoke about partially destructive structures. Did you give an example of that because I didn't appreciate that? Sinan - So, when I say partially destructive structures, imagine just ordinary reinforced concrete frame which is currently designed, again, going back to this Christchurch example, many buildings just after the earthquake which was conventionally designed, which is just structures which are fixed to their ground which don't uplift as in the example that I've illustrated which don't have a base isolation at the bottom. So, these buildings just get damaged and when I say damaged, this is all control damage. So, what would happen is, first, the beams would get damaged and then slowly, they would migrate to the columns because we designed beams to be weak so that they can dissipate the earthquake energy because they're not as essential as the columns. So, they get damaged first and then the damage would migrate to the columns. In the meanwhile, the building is supposed to stay intact. But in terms of damage when I mean damage, you would see cracks on the building, you would see big cracks on the column and beam interfaces. This is all stuff you would expect. On top of it, after an earthquake, if it has gotten to this level of damage that it cannot be repaired which is very common because if you imagine a reinforced concrete building again, it's got steel bars running through it. So, how are you going to be actually removing those steels which have yielded completely during the earthquake without taking the column out and without replacing the whole structure. So, it becomes a very difficult issue. It is actually, as I said, very common way of designing structures and it will just happen to any ordinary structure that you can imagine. Steel has a huge variety of uses, from armoured cars to and inside jet engines. Do we still have more to learn about steel? Steel has a huge variety of uses, from armoured cars to and inside jet engines. Do we still have more to learn about steel? To find out, Ginny Smith talked to Lucy Fielding, a PhD student in Cambridge University Department of Materials Science and Metallurgy, who works on super-high strength steels for armored cars etc. Ginny - Now, steel kind of feels like it's been around forever. Are we really still finding out new things about it? Lucy - Well, as my supervisor used to say, the universe has also been around forever and we're still finding out new things about it. So, you should never underestimate the new things that you can still discover. One of the wonderful things about steel is that because we've known about it for so long, because it has been around for so long, and I think the oldest steel artefact that's ever been discovered is about 3,500 years old - so that's older than Stonehenge - is that we've had a long time to try and understand it. That means that we're much more advanced in terms of where we are because we've had all of that preliminary work done for us back in the last century. Ginny - So, what exactly is steel? I know it's a metal, but it's not on the periodic table. It's made up of some other things. Lucy - No, exactly, so steel is actually a mixture of iron and carbon. So, it's an alloy. You can also add in other elements to do different things, but in reality, what you have is, you have pure iron that contains 0% carbon and then you add a little bit of carbon in, so maybe, anything from very small amount to moderate amounts like maybe 4% carbon, you might get away with calling that steel. If you keep adding carbon, it goes back to being iron again which is a bit odd, but we've got so small window, iron with a little bit of carbon in is steel. Ginny - Why is it so useful? Why do we use it for so many different things? Lucy - Well, there's two reasons really. One, it's cheap and two, it's everywhere. Iron is pretty abundant in a lot of places around the world, and that is what in a sense makes it cheap. It's relatively easy now to extract. It's easy to work with and it's also able to be recycled. So, we want to try and use it for as much as possible because of its cheapness, because we don't have a problem with running out of it. Ginny - Now, you said you work on super strong steels. What do you have to do to this stuff to make it that strong? Lucy - Well, you can do quite a lot of things fundamentally and we have to understand what strength means when we talk about metals. When we say strength, what we mean is, how much force can we apply to it before it permanently deforms. So, we have to understand what happens when that metal deforms. On an atomic level, what is essentially going on, is the atoms are moving relative to one another. Now, in a regular metal, well, in any metal really, those atoms are bonded together. So, if you're going to start making them move past one another and change their position, you're having to break through all those bonds. And that's what requires you to apply a force. That's what requires you to put energy in. So, what we try and do as metallurgists, is we try and find ways to stop the atoms being able to move past one another so easily. So, one method might be to actually try and deform the material a lot because then the atoms move around a lot. They get all jumbled up. They get in each other's way and it becomes progressively more difficult. Another method might be to mix in other elements, so other atoms of different shapes and sizes. So, carbon is one. Typically, high carbon steels will be stronger than low carbon steels, but you can also add in other elements like aluminium, like silicon, like chromium. Suddenly, you've got atoms all in different shapes and sizes everywhere and again, that makes it difficult. We can even do something called precipitation and that's when we try and make a second compound appear inside the first compound. So, you might be familiar with precipitation. We dissolve salt in water while it's hot, cool it down and the salt starts crystallising out. And you can do something a little bit similar with metals and these blobs of precipitate of a second compound will get in the way of the atoms and stop them moving. I think Dave has got some little experiments to illustrate how we can change the behaviour of steel with some fairly simple techniques. Dave - So at the moment, if you're in the audience, we should have some paper clips being handed out. Kate - So, these aren't special paper clips. They're not special science paper clips. They're just normal ones that anyone could buy. Dave - These are just perfectly normal paper clips. What I want you to do is just sort of stretch your paper clip out a bit so you can get at it, forming a bit of a kind of quadrilateral. So, just stretch it out so it's not overlapping itself anymore. Now, what I want you to do is we would think about distorting this material. So, Lucy was talking about how materials get stiffer as you distort them more often. What I want you to do is pick a straight bit which hasn't been bent already and then just between your fingertips, bend it about 90 degrees and make a really nice sharp bend around with your fingernails and try and feel how hard that was. Remember how hard that was. Kate - Just remember to do it with your fingertips because I was doing it earlier, sort of brute force because I need that for a paper clip and I couldn't feel anything. Dave - So, just bend it around one of your fingernails. Remember how much force that required. Now, bend it back again and see if it's harder or easier. Boy - Quite a lot harder. Kate - So Dave, should that have been harder or are we just getting weaker with every bend? Dave - So, if you do it too often, and the material just gets weaker and weaker, and as it gets more and more brittle, the only way it can change shape is to crack, and that's really bad because your steel gets weaker. So, that's kind of dull. But one of the other reasons why steel is really, really important is, it's not just the material itself and how you bend it which affects the properties. It's how you heat it. Kate - Yeah, I can see you're getting a blow torch here, Dave. And we haven't got a blow torch under everybody's chair. I'm very sorry. I wanted to, but health and safety got in the way. So, we'll light up the blow torch. Dave - And so, I'm going to heat up this paper clip. Kate - The flame is going a different colour. Should that be happening? Dave - So basically, what we're doing here is flame test. So, there's a little bit of sodium from my sweat on my fingers and that makes the flame go orange. But the steel itself is now going orange. Kate - So, it's glowing sort of red-hot as I'd call it. Dave - And I'm just going to let it cool down. It's actually orange hot. I'm just letting it cool down to room temperature very slowly. If you do this at home, beware that it stays hot longer than you think it is because it looks like it's not red anymore, but it doesn't mean it's not hot enough to hurt you. I'll just put in some water to make it cold enough. And now Kate, try bending that. Kate - It's really, really soft and malleable and sort of squidgy. I've got also burned bits all over my hands now. So, if I compare it to the other bit, it's a lot more effort whereas this bit is really soft and squidgy, should that have happened or you've just destroyed the paper clip? Dave - When I heated it up and let it cool down very, very slowly, that means that all of these imperfections, as they get hot, it kind of relaxed back their normal state and then they can move really easily for a while. As you bend it, it should get stiffer, and stiffer, and stiffer until it gets really hard to move again. Ginny - So Lucy, you work on super strong steels. So, you're not going to want to do what Dave just did and he start to make it really soft, but what kind of applications are you using these steels for? Why do you want to make such strong steels? Lucy - Well first off, you're a little bit wrong in that, we always want to heat up the steel to make it soft. This is a very common first step in steel production, getting it hot because when you see steel products, they are not in ingots - the shape that you might get them when they're being cast. You often get steel in the form of plates in rods and I'm sure that Sinan is familiar with I-beams and other structural forms of steel. So, you actually want it to be soft so that you change it into those shapes very easily. The other reason that we want it to be soft is because it's a good first step when we're producing more complex structures to just heat it up so that it's nice and soft, and uniform, and then we can cool it down at different rates, and we can create much more complex structures. These kinds of structures are immensely varied. Honestly, I mean, you can use it for quite a lot of applications. So, we see applications in oil pipelines, oil rigs, in nuclear submarines. In the nuclear industries, there's a lot of steel. I work on high strength armour steels at the moment. Another very common application for steels is bearings. So bearing steels are very, very common, some of the most efficient, high performance bearings in the world are made from steel. And lastly, jet engines, which is a fact that not many people know. So, you're very familiar probably with nickel super alloys and things like that that are used in the most advanced jet engines. But many people are unaware including sadly some people who actually make jet engines that the central shaft of the jet engine that you mount all of the turbine blades on is still commonly made from steel which needs to be extremely high performance material. So, there's a huge range of applications. Ginny - So, who's got some questions for Lucy about steel? Yeah, we've got one at the back there. Sam - My name is Sam. I'm from St. Ives and I'm 12 years old. I might have misheard this in like a science lesson, but if you mix like, I don't know what element is, would you make like a steel called Damascus steel. Lucy - So, you're asking about Damascus steel. That's quite interesting. Now Damascus steel is a very high performance steel that used to be manufactured quite a long time ago. If I'm perfectly honest with you, nobody really knows how it was made, but it is remarkably hard. It holds a very good edge. So, it was often used for cutting blades and in fact, I think that Damascus steel was paid as tribute to Alexander the Great at one point because of such a finely prized material. Now, there probably wouldn't have been a lot of control over the elements that went into that steel because typically, in the ancient world, when they made steel, it wasn't very good. They couldn't control the quality of it. They didn't necessarily know about getting elements like vanadium or chromium that we would add into steel today. So, a lot of the old steel makers, they had to work with what they had. Nevertheless, they managed to come up with some quite extreme examples of high performance materials and Damascus steel has often been associated with carbon nanotubes. There is some speculation which is questioned, it's not certain that actually, the way in which carbon was added into the steel and the manufacturing process was able to generate carbon nanotubes which are present within the Damascus steel. I'm a little bit unsure of the veracity of that and I'm not sure how much of an effect that would have in reality, but it's a bit of a gimmicky claim. Dave - I've read recently that it was also associated with a certain ore body, a certain form of ore which they're digging up to make the iron from and that ran out and then they couldn't make any more Damascus steel. Lucy - Yeah, that's quite possible. I mean, a lot of the steel around the world obviously was just made from what they can dig out of the ground. So there would be very different composition or variations just dependent on the geology of the area. Ginny - Kate, do we have a question from Facebook? Kate - Yes, talking of carbon nanotubes, Jaehyeon Hwang asks, "Carbon fibre and carbon nanotubes are materials with lots of potentials. I wonder how those kind of materials are being applied to your area you study for and if you can think of any commodities, let's say, 20 years from now, that might have been made from carbon nanotubes and carbon fibre." So, are carbon nanotubes and carbon fibre going to take over from steel? Lucy - I have to be careful not to be too rude about this because it's well-known in my field that if you insert the phrase 'nano' into your research, you get a lot more grant money which is why the steels that I work on have now been renamed nanostructured steels. Now, carbon nanotubes did indeed attract a lot of excitement, a lot of interest when they were made because they drew some exceptional claims. People were claiming that they had this strength of 3,000 gigapascals. Now, just to put that into context for you, the strongest steels commonly in use today, excluding the kind of very specialist high-end steels are maybe about 2.5 gigapascals. So, that's a factor of over a hundred in terms of difference. Now, what their paper about carbon nanotubes didn't mention is that the carbon nanotubes that they use to measure the strength were 300 nanometres long. That's not very big. In a structure like that, we have something called a perfect crystal. So essentially, there are no defects in the crystal whatsoever. There are no missing atoms. It's a perfect structure of atoms. Each links to one another in a regular arrangement. Now, steel derives its strength as I explained earlier from atoms all being higgledy, piggledy and not really being able to move for that reason. And that means that you can achieve this strength state in steels of any size. The problem with carbon nanotubes is they derive their strength from being perfect. So essentially, the strength of a carbon nanotube is related to the strength of the covalent bonds between the carbon atoms which are incredibly strong. So, you can obtain very high strengths from very small carbon nanotubes. However, as a result of entropy which says that we will get disorder in a system, if you make a carbon nanotube bigger than about 2 mm, it starts to get defects in it and its strength absolutely plummets. Now unfortunately, there was a lot of excitement around saying, "Space elevators. Let's make space elevators out of carbon nanotubes..." to which the response of the steel community was, "We can build a space elevator out of carbon nanotubes as long as space is only 300 nanometres away." Carbon fibre is different. Carbon fibre is an exceptionally interesting material because it's what's known as a composite material. So, it's made up of woven fibres of carbon which are very, very strong, very tough, and when mixed with epoxy resin to make a composite, provide a very lightweight, very strong, very tough material. But it is extremely expensive and that at the moment is its downfall. It's also a lot harder to recycle than steels, but we are seeing it used in applications where lightweight strength is required such as racing cars and so forth. Another similar material is Kevlar which I wanted to mention today because its inventor, Stephanie Kwolek died last week. But that's become a very, very useful example of a composite material used in armour technology. Where carbon nanotubes really come into their own is with their electrical conductivity process. But it's thought that carbon nanotubes offer a lot a very promising potential for electrical transmission, electricity distribution and so forth. But in terms of strength, I disdain it slightly. Hannah - My name is Hannah and I'm from Cambridge. I was just interested. You keep talking about recycling. Is there a limit to the amount of recycling for the types of special steels that you're working on? Lucy - Well, I suppose there is in terms of composition. In that, it takes quite a lot of work to get the composition right and a lot of these steels are very sensitive to composition. So I suppose, if you were to sort of check everything into a big vat, you basically have lost control of your composition to an extent. So certainly, we're looking at tightly control in the composition, it would be difficult to recycle them. But there are a lot of applications for steel where the composition doesn't matter so much. So yeah, I'm not aware too much about that. I imagine there might be a problem, but recycling steel is still very feasible. 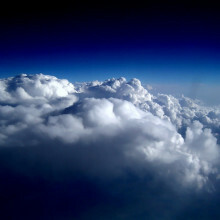 Could we stop climate change by pumping particles into the ozone? And more importantly, should we? Dr Kirsty Kuo- Research is an associate at Cambridge University Department of Engineering and works on a project called SPICE. SPICE is trying to mitigate climate change by using a giant balloon to pump sulphur dioxide into the atmosphere. She told Ginny Smith what climate engineering is and how we could use it to help stop climate change. Kirsty - The field that I'm working on is called climate engineering. It's an idea that has been around for some time, but it hasn't really been talked about because it's quite controversial. The idea is that we could modify the Earth's climate so we could make it hotter or we could make it colder. And now because global warming is such a challenge for us in this generation, we're starting to think about ways that we could make the climate colder so that we could counteract the effect of global warming. Ginny - I thought global warming, we're causing that by burning lots of fossil fuels, putting on this carbon dioxide up there. We just need to stop that, find new methods of making energy and then we'll be okay. You're doing something a bit different though. Kirsty - Yes, so our message is that absolutely, we have to reduce our carbon dioxide emissions. There's no way we can get around that. It's something that we have to do. But it's a bit like your house being on fire really. If your house is on fire, you want a fire engine to come and put it out. And that's a bit like, if climate change happens, we want something that can have quite an instant effect and quite a big effect. And so, we're thinking about this idea of climate engineering. Unlike a fire engine which the effect is to put the fire out and that's all it does, climate engineering would have lots and lots of different effects. It wouldn't just lower the Earth's temperature. It would also cause changes in rainfall and changes in local climates, and also, changes in chemistry in the atmosphere. And these changes are really serious and it's not something that we want to take on without thinking about it and doing research, knowing exactly what's going to happen. Ginny - So, how are you going to go about making the Earth cooler then? Kirsty - So, our idea comes from volcanic eruptions particularly in 1991, Mt. Pinatubo erupted and it put lots of ash and other chemicals up into the atmosphere. One of the things they put up was sulphur dioxide. These sulphur dioxide particles are really quite small, but they're just a perfect size to reflect some of the sun's light that's coming towards Earth. And so, these particles produced a cooling effect of about half a degree C for 12 to 18 months after the volcanic eruption. Our idea is that if we could imitate a volcanic eruption then maybe we could see a similar cooling effect. Ginny - I don't really like the idea of imitating a volcano. A volcano is quite scary and quite dangerous. I'm guessing you're going to do it in a slightly more controlled way. Kirsty - That's right. We're not going to go and just blow up volcanoes around the Earth. So the idea is to get some kind of reflective particle whether it's sulphur dioxide or something else, and to pump it up into the stratosphere and at a height of 20 km because that's where it will stay for about 12 to 18 months before these particles start to fall down to the Earth. Ginny - How on earth do you get it up that high? Kirsty - Well, there's lots of different ideas of how you could do it. So, you could say, Well, we've got airplanes that fly at about 10 km. There are some very special military ones that can fly at 20 km, so why don't we use those? The problem is, is that it takes a lot of energy to get the aircraft up to 20 km and get it back down again with a package of these particles. So, much more energy efficient way of doing it is to build a giant structure where we could pump these chemicals up. Now building a giant tower isn't possible because the strength of the material isn't large enough. But the way we propose to do it is to build a giant hose and this hose would be held up by a balloon and the balloon would have to be the size of the Wembley stadium to hold up this 20 km of hose and through the hose, we can pump these particles and spray them out at 20 km. Ginny - What's the balloon filled with? Is it helium, like an almost sort of party balloon that floats? Kirsty - It would probably have to be hydrogen because helium is in quite short supply and it's very expensive. Ginny - So, we've got a giant hydrogen balloon in the sky with a hose and then how do you get the material to go up the hose? Kirsty - Well, you have to pump it up like when you turn on your hose pipe at home, there's water pressure which is driving the water through the hose. In the same way we'd have to supply pressure at the ground level to move these materials up through the hose. The problem is that the pressure is going to be extremely high. Even in industrial applications where they use very high pressures, it's even higher than that. So, that's one of the big engineering challenges of thinking about this kind of technology. Ginny - And how much of the stuff would you have to put up there to make a difference? Kirsty - Well, they've estimated that to cause a 2-degree change in the global mean temperature. We'd need 10 million tons of sulphur dioxide. That sounds like an awful lot, but once it gets spread around the Earth, it actually turns out to be about 1 teaspoon of material for 1 square km of the Earth's area. Freddy - I'm Freddy from Little Downham. I was thinking because I watched a YouTube video about ways the universal or the world could end. And it included super volcanoes which could block out the sky and create another ice age. Ginny - Freddy, are you asking Kirsty whether she's planning to end the world? Freddy - No, I was thinking, is that the same sort of thing or is that slightly different? Kirsty - Yes, that's exactly the same thing. And so, yeah, it is quite scary, isn't it? But Mt. Tambora erupted about 200 years ago and this eruption was so big that it caused something that was called 'The year without a summer'. Basically, in Europe, there was no summer that year because of this volcanic eruption and it led to huge food shortages and famines. The interesting thing about that year without a summer was that, that was a year that Mary Shelley wrote Frankenstein. And so yes, it is possible that a big volcanic eruption would cause huge problems around the world. Ginny - So, if in a few years' time, you see Kirsty and she's stroking a white cat and asking for a million pounds or she'll blow up the world, she could do it. Erusha - My name is (Erusha) and I'm from Cambridge. My question is, would you need to get some kind of international agreement to do this presumably because it's global temperatures that you're affecting? Kirsty - Yes, that's one of the huge challenges. So, what we've done to date is we've been doing a feasibility study to try and understand the effect of climate engineering. We haven't done any actual experiments and that's because of the international agreement that you would need. There's a lot of discussions that are going on as to how you would get this international agreement. It's not really clear how that would happen and whether it would ever happen. And so, there is a fear that someone could decide to do this on their own and it would affect the whole Earth. But hopefully, we'll never get to that stage. David - I'm a bit concerned about acid rain. So, you put sulphur dioxide in the atmosphere, when it rains, you wash all these sulphur dioxide down and that's sulphuric acid. Kirsty - Yes. So, acid rain is one of the problems with sulphur dioxide. One of the other major problems is that it destroys ozone and so, you would essentially destroy our ozone layer. And that's why, part of this research project is to look at different types of particles and to see if there's a better particle that we could use that wouldn't have the same effects on stratospheric chemistry. Sam - My name is Sam. I'm 12 and I'm from St. Yves. You said there'll be a big balloon in the size Wembley. What if there was a thunderstorm? Kirsty - That's a great question. Now, most of our weather happens much closer to the Earth in 20 km and so, it's unlikely that the balloon would get hit by lightning. But it's very likely that the hose could get hit by lightning because basically, we've just stuck a giant lightning rod up into the atmosphere saying, "Come and hit this thing with lightning." And so, that is something that we have to think about and whether we make it out of a non-conducting material to try and reduce that effect, or whether we have to take other measures to try and reduce the possibility of it being hit by lightning or somehow manage that. Peter - My name is Peter from Cambridge. I was wondering, could you try it first by pumping ozone into the ozone layer before trying it out with sulphur dioxide? Kirsty - That's an interesting idea. Well, I think however it gets tried out, it's going to have to be very carefully managed because once you disturbed the atmosphere, it's not just a single point that you're disturbing. Because of the winds that travel around the Earth, you're going to be disturbing the whole climate. And it's also very difficult to know what effect pumping anything into the atmosphere has because I can pump it in here but then how do I know if the rainfall in India has changed because of what I've done or because of some other process. And so, that's one of the real challenges with, how could you test this type of engineering technology. Helen - I'm Helen from Cambridge. So, the idea is to lower the temperature, but obviously, some places, temperatures has been lowering and that's not a good thing, well that would make it worse in some places and better in others. Kirsty - Yes, that's absolutely right. So, climate engineering will not be a win-win situation for everyone. It would cause a global mean temperature drop, but some places will get hotter, other places will get cooler. Also, the rainfall patterns will change. So, some places will get less rain, some will get more rain, and it doesn't solve all the problems of climate change even because there's ocean acidification because we have more carbon dioxide in the air. It's becoming dissolved in our ocean. It's destroying coral reefs and things like that, and climate engineering wouldn't fix ocean acidification. So, there are many cons to this type of technology and it's something we'd have to think very long and hard about before we decided to do something like this. Ginny - Kate, you've got one final question. Kate - Yeah, for me. So Kirsty, everyone has been saying, "There's a problem with this and it will raise the temperature, it might destroy the ozone." There are so many problems with this. Why are you still doing it? Kirsty - It does keep me awake at night, thinking of all the problems with this kind of technology. Basically, we're worried that one day, we might get to a point where doing nothing is no longer an option and doing something to lower the global mean temperature despite what the side effects are, whether they're known side effects or unknown ones, it might be something that we accept because the situation is so dire.